I mentioned in an earlier blog that my husband and I have decided to scrap presents between ourselves. Instead of spending money on unnecessary stuff we will choose instead to spend it more wisely (in our view) on memories and experiences. Life really is about building memories and I can think of no better way to do it (it also takes the hassle out of shopping for presents when you have no idea what to get someone!). So it came to my husbands birthday (in march) and it fell to me to think up an adventure. After much deliberation (I won’t give my other ideas away just yet, I might use them for pressies in the future!) I settled on a day cruising the Avon river courtesy of Bidford Boats. It suited on so many levels – it was something new to us as a family (and on my bucket list! ), it was suitable for us all and allowed us to invite friends. 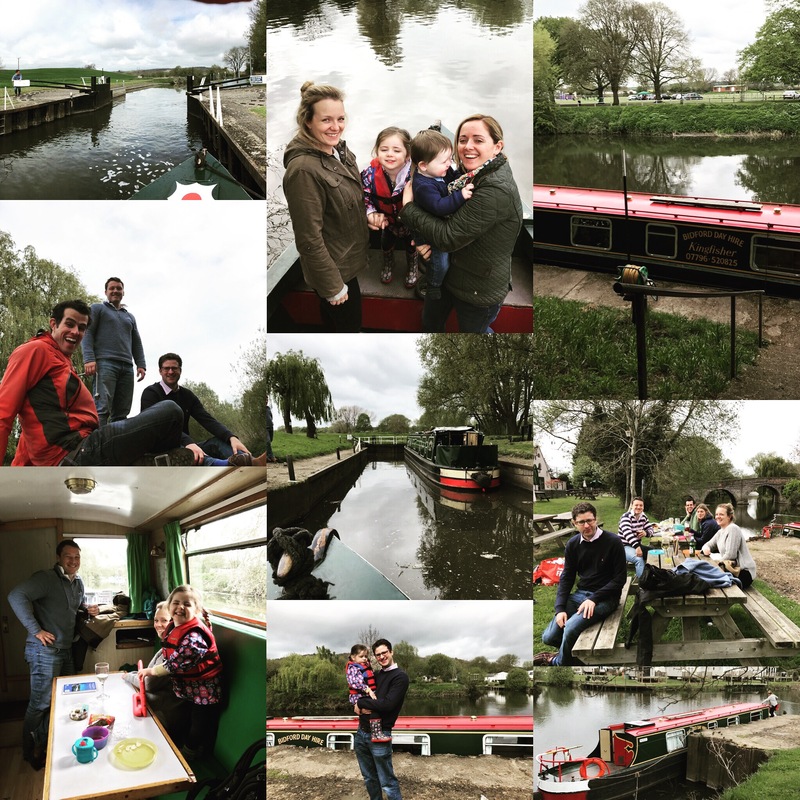 Bidford Boats operates a very small, low key boating business (bizarrely combined with a dog grooming business!). The booking process couldn’t have been simpler – I simply telephoned them to make the reservation and paid on the day. Simple. I’m always slightly anxious when money hasn’t passed hands before the day so I did telephone a few days prior just to double check the details but everything was in order. The boat was booked for the day (9.30am-6pm) and cost £130. The boat can apparently take up to 10 people (more about that below!). Having never stepped foot on a narrow boat I had no sense of what to expect from the boat itself. I was pleasantly surprised. It was clean and well equipped. It had a small but perfectly adequate kitchen area – with a gas hob (don’t expect tea in a rush! ), an oven and a mini fridge (which kept our prosecco nice and cold!). There was also a flushing loo on board….handy when you’re travelling at snail pace with children in tow! The boat had places to sit both inside and out and a table that could be put up in the kitchen area. The boat had heating but we didn’t need it (and couldn’t work out how to put it on in any case!). We had 6 adults and two children on board and had it rained it would have been very cozy! As it happened the weather was kind and we spent most of the day flitting between the deck areas and inside. From a safety point of view, the boat was equipped with enough life jackets for everyone – perhaps most importantly for the children. When I told friends of our plan, most laughed and wished me luck (not a great start!). I’m not one to usually doubt myself especially when it comes to holiday/day-trip plans but on this occasion I did start to worry that we’d taken on a little too much. Was it really sensible to put a three year old and a just crawling 9 month old on a boat for the day!?! Now, had we spent the day on the boat as just the 4 of us (mummy, daddy and 2 children) I would, in hindsight, say that it wouldn’t have been the most family friendly day out. My husband would have spent the entire day driving (or steering?) the boat and I would have been largely stuck inside occupying the children. How we would have managed the locks is beyond me. We were fortunate that some of our closest friends agreed to join us. Not only did this mean we could spend a day with friends (a rare occurrence!) but it also meant that we were able to share the load when it came to driving, locks and keeping an eye on the children. Their presence really made the day the success that it was…we had a wonderful time and they reassure us that they did too! So if you’re planning a similar day out/holiday I would highly recommend that you find some willing (!) friends and family to take along for the ride! Bidford Boats provided us with a copy of the Pearson canal boat guide (in this case the Severn and Avon edition). This was a great help. It gave us an easy to follow map of the canal, showed us where the locks were and also pointed out various places to stop etc on route (particularly useful if you’re not familiar with the area). Don’t be over ambitious. Narrow boat travel is incredibly slow! Whether, like us, you’re planning a day trip or something longer, don’t try and get too far in one day. Little is more. We left Bidford on Avon at 10am ish (after a brief safety introduction etc) and arrived at the Four Alls pub (its a lovely pub!) in Welford at 12.30pm (in time for a drink and a picnic lunch!). If you were taking the car from Bidford it would take 6 minutes to drive the 3.6 miles! If you’re embarking on a canal boat holiday/day with children in tow, picnics are the way forward. You have no real sense of what time you may arrive at a pub on route (you may hit a queue at a lock and that could put your timings back a bit!). If you have a picnic on board then the children can eat as and when they need to and you won’t be worrying about reaching a particular place in time for lunch. Pack plenty of entertainment. Our toddler really enjoyed the whole experience and is still talking about it to this day. She loved helping at the locks and spent large parts of the day waving at passing walkers, boats, swans etc. She did, at times, get restless (particularly between locks!) and so some entertainment was needed. We really did have a wonderful day out (despite the weather) and would highly recommend it to families with young children (although don’t forget to find some ‘willing’ friends or family members to join you!). That said, I’m not sure we’re quite ready for a week-long canal boat holiday but I certainly wouldn’t rule it out!